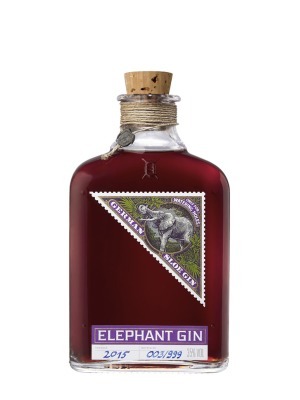 Elephant Sloe Gin is a popular Gin available from TheDrinkShop in 50cl to buy online. Visit TheDrinkShop for the best price for 50cl of Elephant Sloe Gin or compare prices on our other Gin products. Combining the taste of the premium London Dry Gin with the classic flavour of fresh sloe berries, Elephant Sloe Gin introduces a warm, well-balanced, sweet and fruity update to the award-winning spirit. Macerated in Elephant gin for several months, the wild sloe berries add a light and sweet, yet richly rounded, fruity aroma. In order to retain the highest amount of aromatic flavour components, Elephant Sloe Gin remains unfiltered and can be identified by a natural cloudiness. The result is a red-tinted spirit that unfolds a complex bouquet bursting with flavours. Compared to other sloe gins, Elephant Sloe Gin has a relatively low sugar content paired with a higher alcohol volume of 35 percent. This deliberately discreet addition of sugar triggers a perfect balance between the tart and sweet notes â?? without the need for additional artificial flavours. This also makes it ideally suited to mixing in cocktails as well as enjoying it neat. Each bottle is custom- made and adorned with handwritten labels and the purple label marked with the production year and bottle number of each batch. A natural cork with a hand-twisted cord and seal closes every bottle. As with the London Dry Gin, the company donates 15 percent of all proceeds from every bottle of Elephant Sloe Gin to two African foundations that are committed to save the African elephant from extinction. Where to buy Elephant Sloe Gin ? Elephant Sloe Gin Supermarkets & Stockists. You can buy Elephant Sloe Gin online in most retailers and find it in the Gin aisle in supermarkets but we found the best deals online for Elephant Sloe Gin in TheDrinkShop, 31dover.com, Amazon.co.uk, and others. Compare the current price of Elephant Sloe Gin in 50cl size in the table of offers below. Simply click on the button to order Elephant Sloe Gin online now.